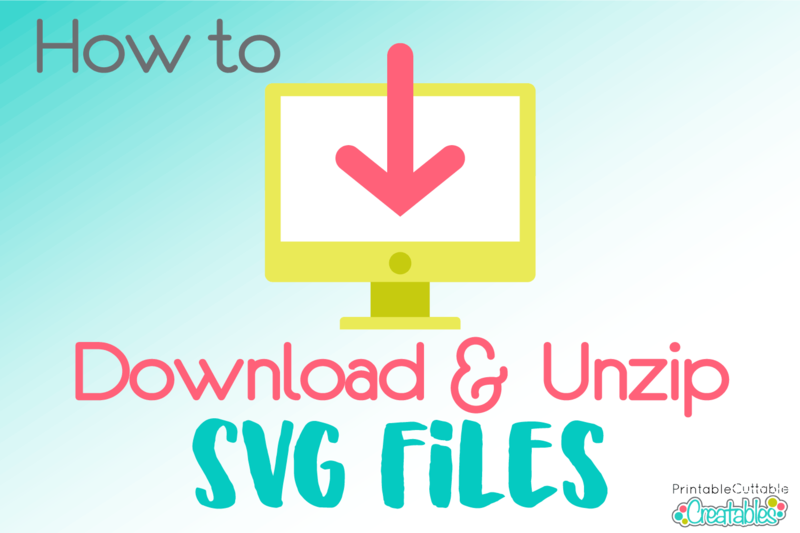 Learn How to Download & Unzip SVG Files! So you’ve found some awesome SVG designs from my Creatables shop, or from another trusted site. But how do you download them and open them in your cutting software? Read on to learn how to download SVG files and in just a few clicks, you’ll be ready to use them with your Cricut or Silhouette cutting machine! 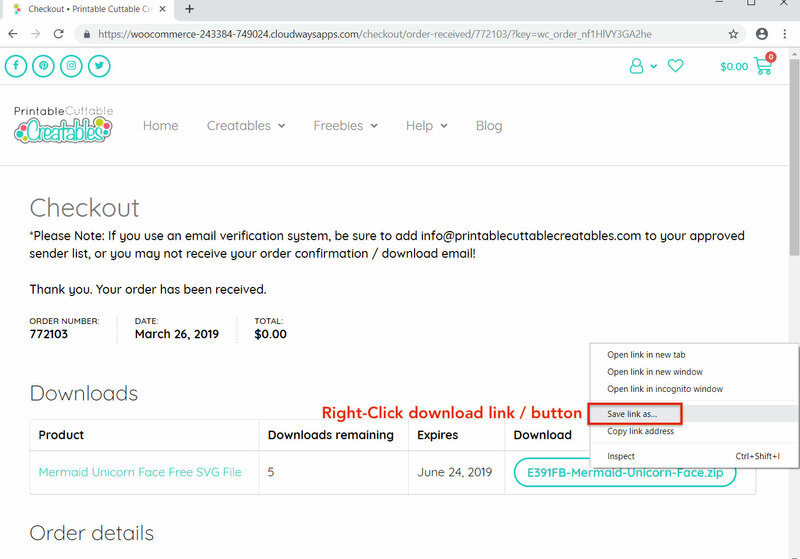 When you order an SVG from Printable Cuttable Creatables and most other sites, you’ll see a download link or button for the design. I highly recommend to right-click on the link / button, and choose “Save Link as”, “Save Linked File as”, or similar option (the wording will vary depending on the browser you’re using. This will open a navigation window that allows you to specify where you want the file to be saved on your computer. Choose where you want the file to go, and click “Save”. Be sure to choose a location that is easy to find. I usually save to my Desktop or Downloads folder. The file will be downloaded to your chosen location. 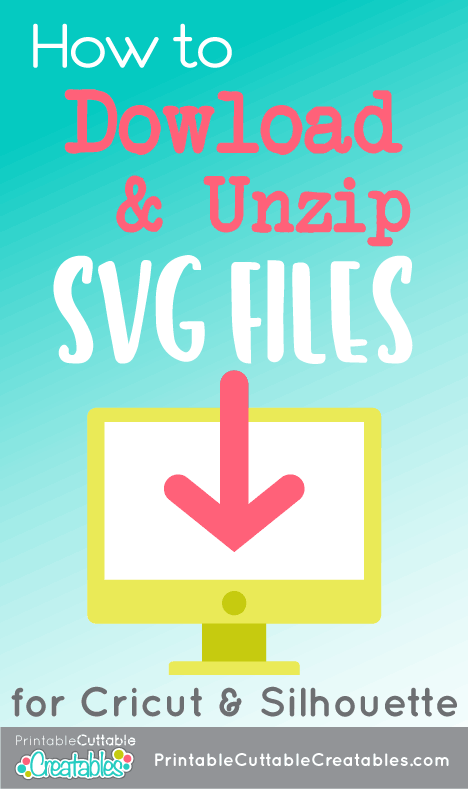 Most SVG designs include several filetypes in addition to SVG format, so the files will usually download as a zip (compressed) file. Zipped files look like a folder or file with a zipper on it. Zip files need to be unzipped (extracted) before you can view and open the files inside. On a Mac, you can just double-click the zip file and it will unzip. A regular folder icon will appear next to the zip file icon. On PC, you’ll need to right-click the zip file, choose “Extract all” and follow the prompts. 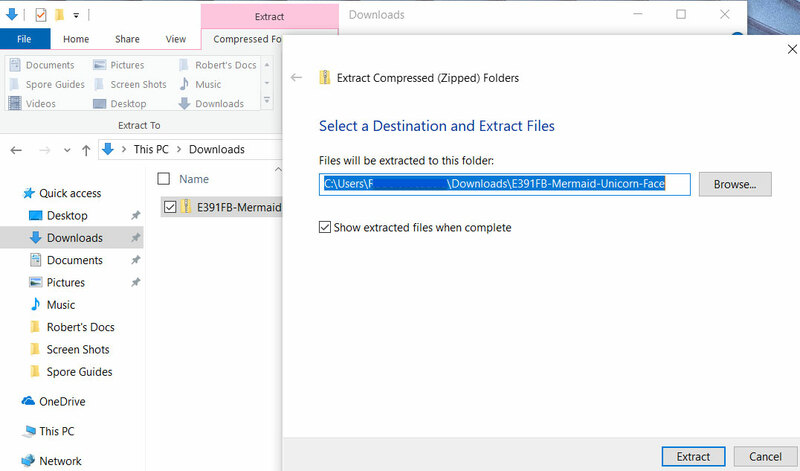 In the Extraction Wizard, choose where you want the file to be saved on your computer. By default, it should unzip in the same location as the original zip file. Click “Extract”. The file will unzip, and a regular folder file will appear next to the zip file. 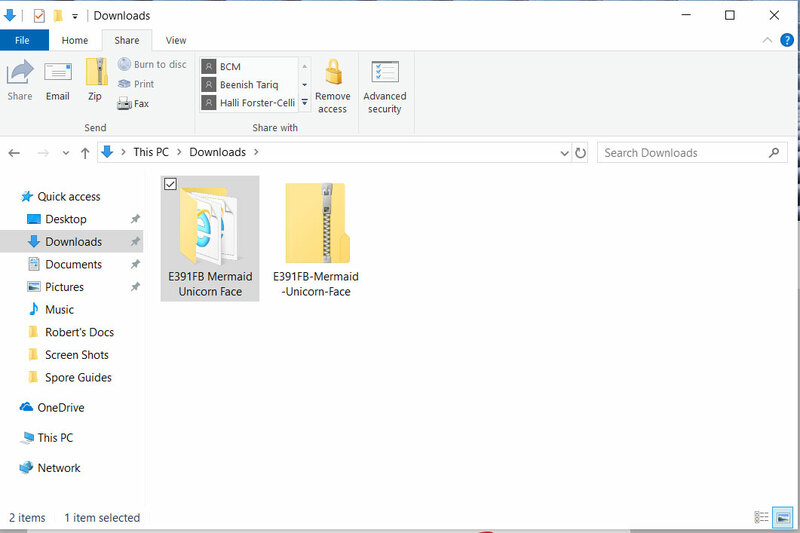 After unzipping, you can move the regular folder to a different location on your computer; for example a folder specifically for cut files. You don’t need the zip file anymore, so you can just delete it. That’s it! Now when you open the design folder, you’ll see all the different filetypes included with the SVG, such as DXF, PNG, and JPEG. The designer may also include instructions, licensing, and contact info (often in PDF or .txt format). Some computers may display SVG file thumbnails as web browser icons (Internet Explorer, Chrome, etc), however they are actually SVG files and should still upload correctly in your cutting software. 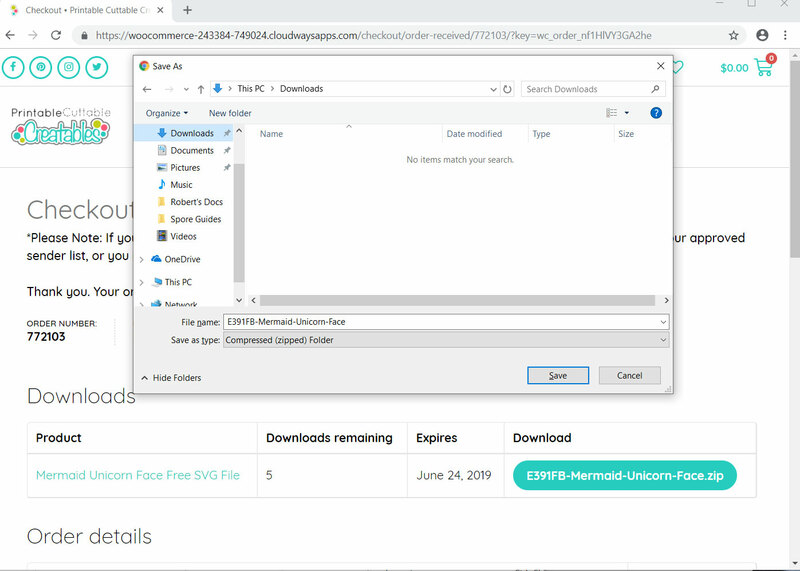 You can check the file extension for “.svg”. You can also check the File Type or File Properties and they should show as “SVG Document” or “Scalable Vector Graphic”. Now you can head to your cutting software to upload the SVG files! Note that double-clicking will not work to open SVG files unless you have specified which program you want your computer to associate SVGs with. Affiliate Disclosure: I may be an affiliate for some products recommended in this post. This means that if you purchase items through my links I will earn a small commission, at no extra cost to you. I only recommend products that I have personally used and enjoy and when you order through my link, it helps me continue to offer you weekly free SVG files, digital papers, scrapbook sketches, tutorials, and other fun things. Thank you in advance for your support! Sign me up for weekly freebies, sales, and exclusive discounts! 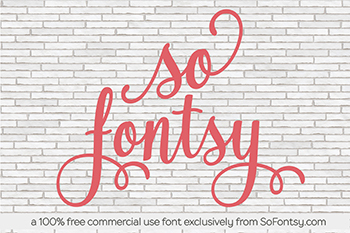 Get a new freebie in your inbox every week, plus exclusive discounts, sales, new designs, and more! At Printable Cuttable Creatables, I specialize in high quality SVG files for Cricut, Silhouette, Scan N Cut, and other cutting machines. I draw all SVG files from scratch, with great attention to detail, layout, and quality. So you can always count on original, one of a kind designs that you won’t see anywhere else. Learn more about Printable Cuttable Creatables! Copyright 2019 © Printable Cuttable Creatables. All rights Reserved.